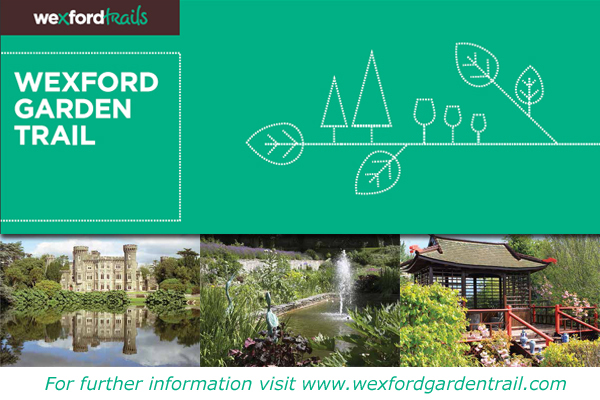 Welcome to the Wexford Garden Trail. We are delighted that you have chosen to visit our county, located in what is traditionally known as the Sunny South East of Ireland. As the largest of Leinster’s counties, Wexford is bound by the Atlantic Ocean to the south and by the Irish Sea to the east. The River Barrow and the Blackstairs Mountains, along with the southern edges of the Wicklow Mountains, bound the west and north. Only an hour’s drive from Dublin, our county is also home to the busy port of Rosslare. Our gardens reflect the history and diversity of the county and its landscape. Some of the gardens were originally laid out in the 18th and 19th centuries while others were established just 10 years ago. Our larger public gardens provide an ideal outing for all the family, and our smaller private gardens will give you not only an enjoyable and relaxing day, but will also introduce you to the large range of plants which can be grown in this temperate region. Our trail includes specialist nurseries for the more unusual plants and, spread throughout the county, award-winning garden centres that provide for all your gardening needs. The owners of all the garden locations on our trail will be happy to welcome you and to assist you with any information you require to enjoy your visit to County Wexford. The gardens are listed in alphabetical order and symbols are used to highlight the facilities at each location. 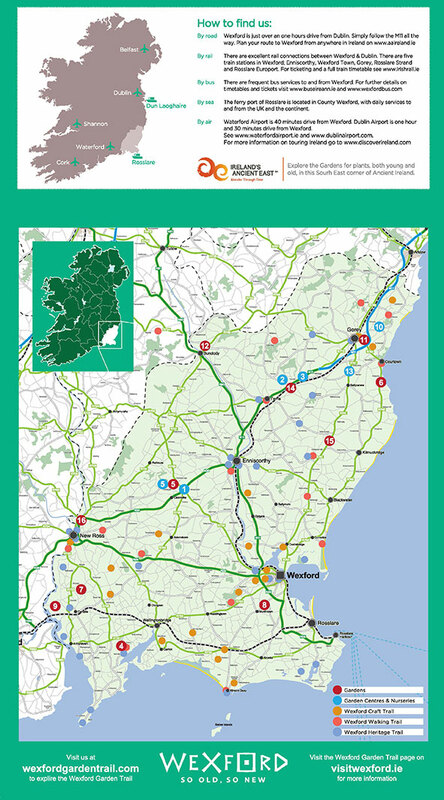 When visiting Wexford why not check out VisitWexford.ie to see what's on in the area.